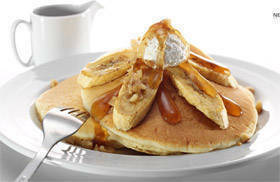 Casual dining franchise, Pancake House, Inc. has announced that it is in talks to expand to Singapore after opening branches in Malaysia. Open since 1970, the restaurant is known for serving delicious pancakes and waffles and has expanded its roster of brands to include Dencio’s, Kabisera ni Dencio, Teriyaki Boy, Sizzlin’ Pepper Steak, Singkit, and Le Coeur de France. The quick casual restaurant, Yellow Cab, offers franchising and already has overseas branches in Guam, United States, Malaysia and Qatar. The company celebrates in 10th year in 2011. It also manages a casual hamburger and burritos brand called Army Navy Burger Burrito. franchise franchise directory franchise fee franchise owner franchise show franchise support franchise system franchisees Pancake House Pancake House Inc.